Sarah Bockel and Dylan Wallach play Carole King and her songwriting partner-husband Gerry Goffin in ‘Beautiful: The Carole King Musical,’ playing through Sunday at the Denver Center’s Ellie Caulkins Opera House. One needn’t be a big fan of Carole King to enjoy the musical based on her life story. By the end, though, you may find you’re a bigger fan than you thought. Those of a certain age remember the big hits from her breakthrough 1971 “Tapestry” album: “I Feel the Earth Move,” “So Far Away” and “It’s Too Late,” but “Beautiful: The Carole King Musical” reminds us of the earlier hit-machine partnership with her first husband, lyricist Gerry Goffin. While King was still a teenager living in Brooklyn, the duo kicked off a career that included penning hits for everyone from The Drifters (“Up on a Roof”) to The Shirelles (“Will You Love Me Tomorrow”) and even The Monkees (“Pleasant Valley Sunday”). Following her breakup with Goffin, King moved to L.A. and turned to performing her own songs. Her second album, “Tapestry,” went on to sell 25 million copies worldwide. 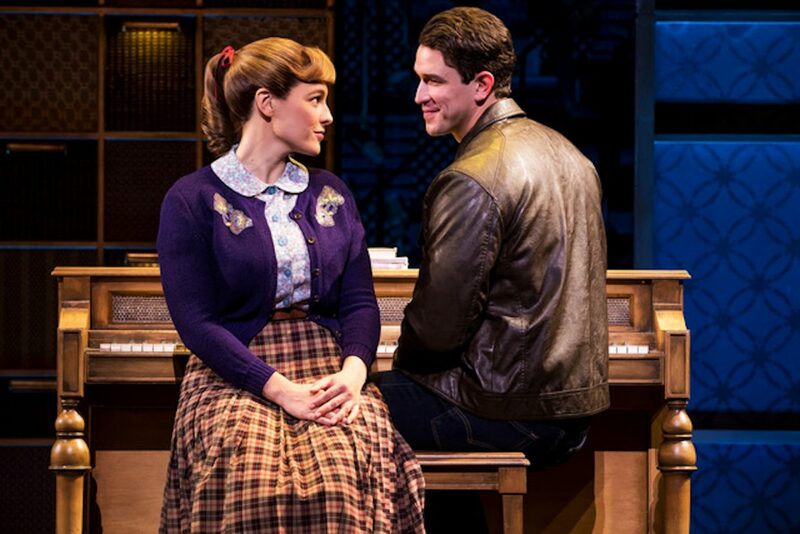 Using a funny, fast-paced plot and a fantastic cast of singers and dancers, “Beautiful: The Carole King Musical” races through those early years and touches on many of the two couples’ hits. Using quick set and costume changes, the story of each song begins with the demo version, then morphs into a full-blown number with The Drifters, The Righteous Brothers, Little Eva (“The Locomotion”) and more. It’s a fun show that had the audience cheering and singing along in places. But it won’t be around long—only through Sunday at the Denver Center’s Ellie Caulkins Opera House. There should still be good tickets available at denvercenter.org.